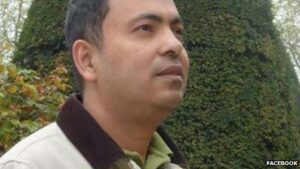 Roy suffered fatal wounds in the head and died from bleeding … after being brought to the hospital in Dhaka. Following the mindless killing of Charlie Hebdo cartoonists in Paris, I wrote in my Post on January 8: “It’s scary to ponder over the possibility of many such extremists ready to launch assaults in the name of Allah, spread in cities and neighborhoods across the world. I never thought in my wildest dreams that such a brutal killing is waiting to happen across our border! Roy, whose blog Mukto-Mona championed liberal secular writing in the Muslim-majority nation in Bangladesh, may have been brutally killed. But can these fundamentalists undermine the power of pen? Avijit, I salute you for you battle for free speech and religious tolerance. I’d like to reiterate that we’re not fighting Islam. We’re fighting these fruitcake fundamentalists; we’re fighting these swivel-eyed loons!